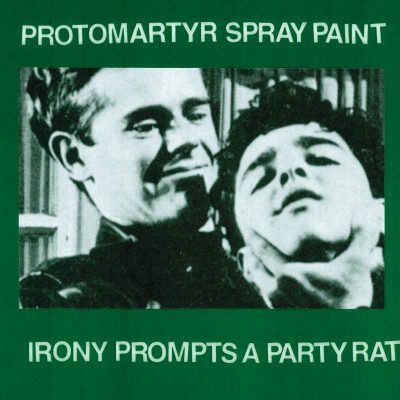 Protomartyr/Spray Paint Irony Prompts a Party Rat 7"
The first time Protomartyr was on our radar had to be in 2013 when Can’t Stop The Bleeding invited them to play at Beerland for SXSW. We’ve been big ole fans since. Over the years they’ve been nice enough to play a couple of our SXSW shows, and then they let Spray Paint open for them on some of their early tour dates. It was on one of these tours that the concept for this 7″ came to be. Each band would record an instrumental and send it to the other band to add vocals. Spray Paint plays and Joe Casey sings and then the other way around. We think it’s pretty good, and we hope you do too. There are 100 Clear 7”s for those kinds of people. No Download card included on this. This is the third collaboration from Spray Paint. The first was with Dan Melchior for the Contributors LP, the second was a 7″ with Ben Mackie. The fourth will be announced shortly. A bunch of buying options below. Including a new Obnox LP!